Has this summer has been the worst season ever?! So this podcast took a while to get going because of some audio errors on my end, but it is finally here! So yeah how are you enjoying this season so far? I personally feel it’s very weak due to the selection of terrible shows, but everyone has their own views on what counts as terrible and good shows. Whats your favorite summer series?! I wanted to vote Kuromukuro* as my favourite, but continuing series from spring don’t seem to be part of the voting lineup. *How is everyone finding Kuromukuro, BTW? I thought Highway and Irenesharda’d be the ones most likely to cove it here. I am actually waiting to watch Kuromukuro when it is released on Netflix in the US. It is on Netflix now. Last I checked, it is only the first cour. The second was scheduled to be released after all episodes have aired in Japan. Ah I see. I didn’t realize there were additional ones out there. Kuromukuro’s 2nd half is airing weekly with subtitles on Netflix Japan a few days after the TV broadcast, but you’ll need a Japanese IP to access it from overseas. Otherwise, you can watch through…underground streaming sites with unofficial fansubs. I cannot stress this enough: NEVER use an anime streaming or download site. I’m not saying this to be a scold from a licensing or piracy standpoint. This is from a computer security standpoint. You’re going to a site that already has no qualms about other people’s property, and then you are asking them to run software on your computer. And you have no idea if they are who they say they are, they have no responsibility to you, and they have no real reputation to uphold. This is a great recipe for malware to be installed on your computer. And don’t think that “Oh, I run antivirus and anti-malware software, I’m fine.” Sites like that are going to be the first places that things get out in the wild, potentially before your antivirus has updated. The reason I’m waiting for it on Netflix is because I want to reward Netflix for licensing it. And there’s plenty of other stuff to do, like play WoW or Overwatch. I didn’t say that. I just said don’t go to streaming or download sites (like “Click this link to download it via http” sites). I only say that because this season I have dropped so many things! That and there are a few series that aren’t terrible, but they sure are going to be remembered after this season. 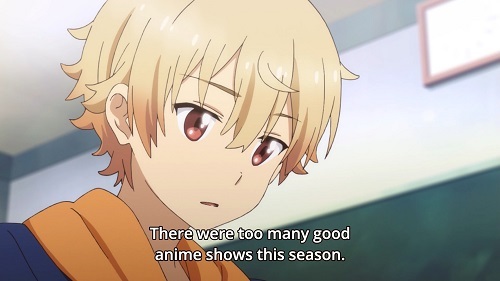 So yeah…that is at least 15 meh series out of 38 “decent” anime airing this season, but yeah my list of soso series is going to be different than someone else because our tastes varies which is fine since we all like what we like. Though I’ve never seen it myself, the funny thing is the manga version for Days won the “Best Shounen” category for the Kodansha contest in Japan when the other nominees were Seraph of the End, Noragami and My Hero Academia. People love a good underdog story I guess? It reminds me of Yowamushi Pedal or any sport series in general about random guys who are not athletic types who get inspired to try a sport for the first time and eventually they get better at it! So I can totally see Days winning because is more realistic than the other three. I’ve never been able to watch even half of that many shows at most during a season. I’d burn myself out too quickly if I tried to watch more than 10 in a season. 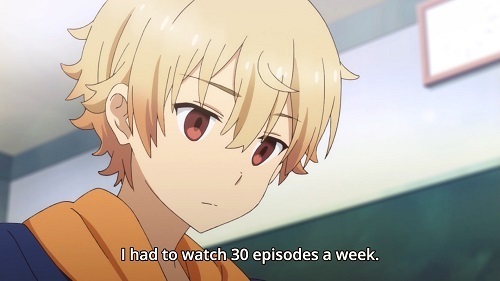 I used to watch about 30+ shows per season myself but I’ve gone down to about 15-20 these past seasons. I sometimes forget to download or watch a certain show until the episodes pile up and I just couldn’t find the motivation to continue it. More so if the series was average to begin with. I’m only keeping up with half of the shows on my list right now and I’m reluctant to remove any of them so that I can muster up some motivation for later when I look at them. I blame mobile games taking up my time. As for Kukomukuro we were doing MechaNORN posts on it, but they were purely audio only because we also added Macross Delta to that as well. I’m up to episode 20 and enjoying it so far! Nice! Catch up with Ep 21-22, those clear up the mystery surrounding Yukina’s dad, Muetta’s origins and the Efidolg’s REAL plans! I finished watching episode 22 this morning. It was really something and I mean that in a good way. PS: I don’t know if it was widely noticed but did anyone see in the recent episodes that the show’s version of P.A Works studios was attacked? That was rather amusing. So yeah, CR and Funi are now sharing streaming content, more or less. Shots fired at Netlix and Amazon; two much bigger companies? Overall, not a very impressive season but at least there are some decent shows airing. 91 days has been a surprise so far! Same for both Danganronpa 3 series as well. Zestiria X on the other hand for me isn’t that great sure it looks fantastic, but the damn story is all over the place especially when they randomly tossed in the Tales of Berseria in there? What? I know that is another Tales game but i thought this was Zestiria only? LOL also my god do I hate the characters especially the boring as dirt main dude wow he is sooooooooooo dumb. I do agree this isnt a impressive season. Tales of Berseria’s a prequel to Zestiria, so the game company saw the Zestiria anime as the golden chance to advertise Berseria within it to build up hype for the game with viewers (who are likely Tales of Zestiria fans to begin with). Berseria also delves deeper into some worldbuilding concepts introduced in Zestiria, so he completionists will get a bigger kick from it. If you think Zestiria’s story is all over the place, gameplayers say the game’s plot progression was even worse, that ufotable’s changes have IMPROVED the story flow. A natural response. A fan of whatever franchise/medium (games, manga etc…) will see and understand things in greater detail than one who isn’t. Mainly because the fan is far more invested and will pay more attention. I just call the show, UFOtable’s Etude de RPG and move along…. amaama to inazuma (very good narrative about what it means to be family told in a very positive, not-overbearingly sweet way), mob psycho (surreal visuals, good character storytelling), and 91 days (deft directing) are the three shows are enjoy the most.